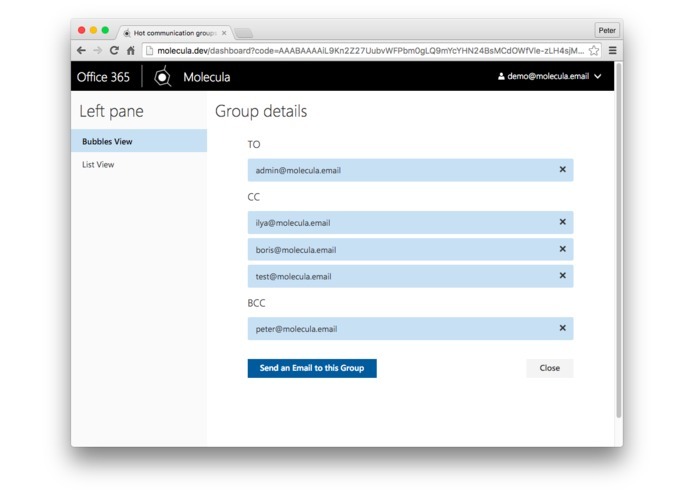 Group details in Molecula Web app. 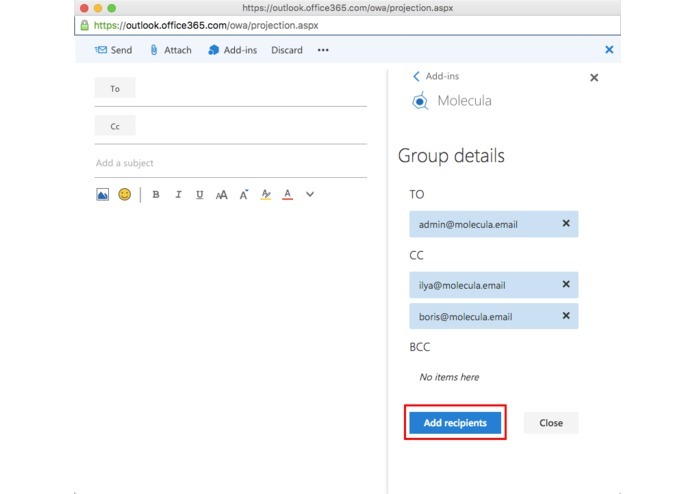 Here you have an option to rearrange recipients and click "Send"
Molecula uses your default emails client to compose a new email with all the recipients you selected. 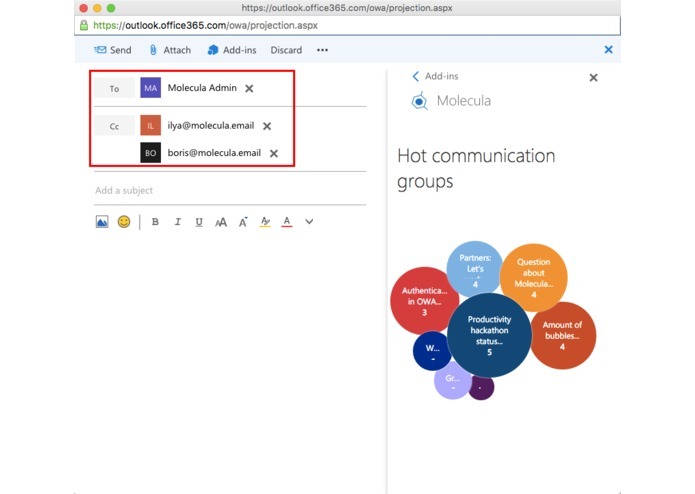 Our team members experience above problem almost every day, which inspired us to create the Molecula - Office 365 Add-In for Outlook. 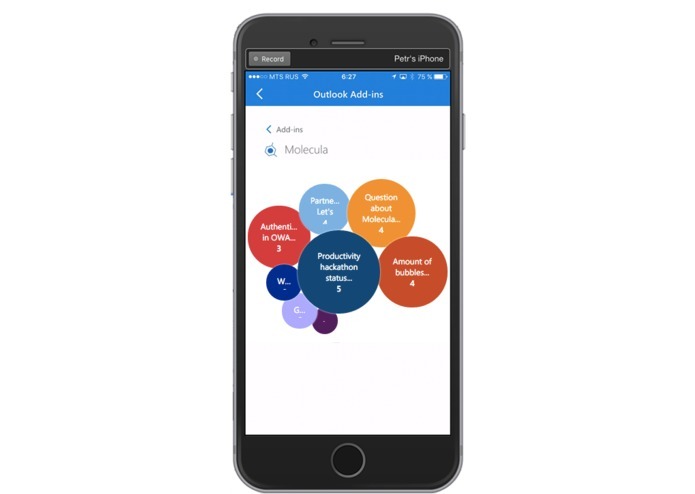 Molecula makes it easier to interact with the people and groups most important to you! 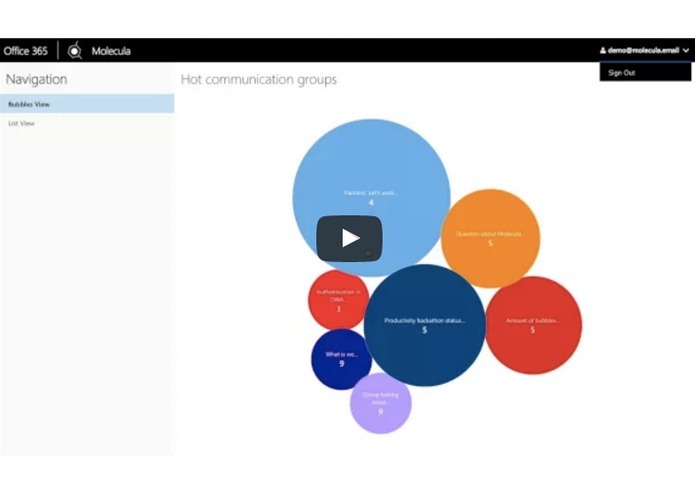 Molecula indexes all emails in your Inbox and groups all the people you communicated with using special criteria. Groups then are visualized in a form of cool bubbles, where bigger ones represent groups of people you communicated with more frequently. Want to start a new thread? 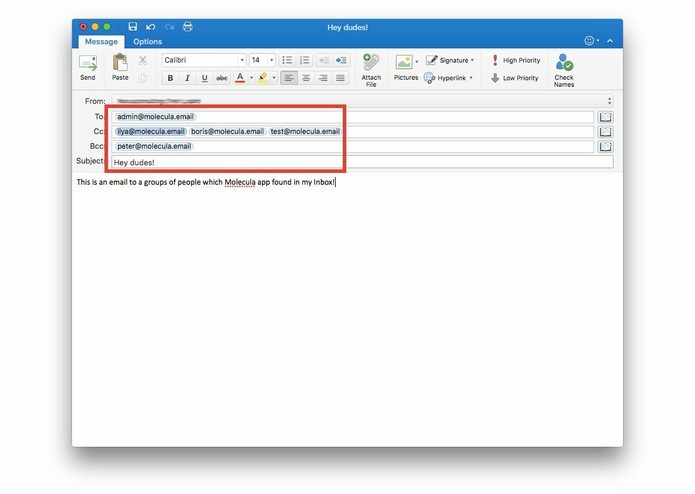 Simply click a bubble, rearrange the recipients for TO, CC and BCC fields and you are done! It was tricky to setup the infrastructure and environment required for Web App using Azure AD and for Graph API. It was also difficult to debug Office add-ins on devices like iPhone and iPad. In addition, there were some challenges regarding the data visualization too. We have spent a lot of time trying to organize the bubbles in the way we wanted. All the members of our team have experience in different technologies. We are proud of the fact that we managed to efficiently stick all our knowledge together and build the product we have today in a very short period of time. 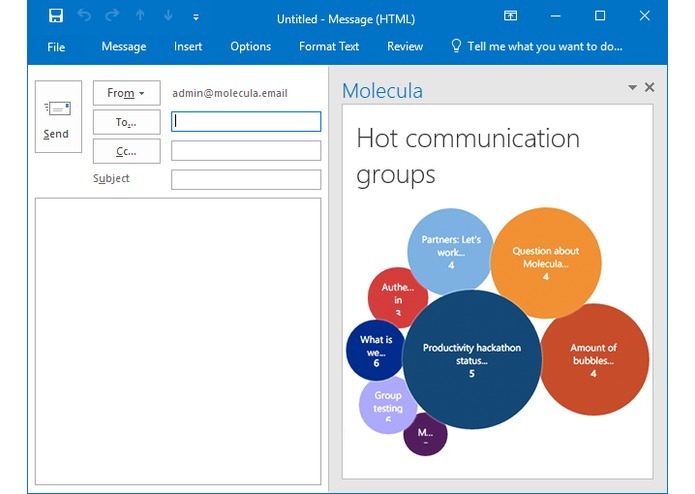 We believe Molecula is useful not only for us, but for many other users of Office 365 and Outlook. In the next iteration, we plan to enhance grouping algorithms and give users better ways to visualize their Inbox. We are working on a new List View screen which will allow users to see all the communication groups with the ability to set filters and order for the list. We also plan to implement integration with Outlook groups and Groups of Contact which will help to automatically create them based on the Molecula’s clever algorithm of grouping. Stay tuned! Who knows, maybe taking part in Hack Productivity competition we have started a new big project which will quickly grow and evolve! At least we will do our best to make it happen! I mostly worked on the idea itself, infrastructure setup and add-in creation. I also did promo video and all the materials for the submission. Visualized data from emails into bubbles. Then designed nice transitions when bubbles pushing each other. I've developed the server-side and algorithmic part of the project. We are excited to announce the first beta version of Molecula Web App! 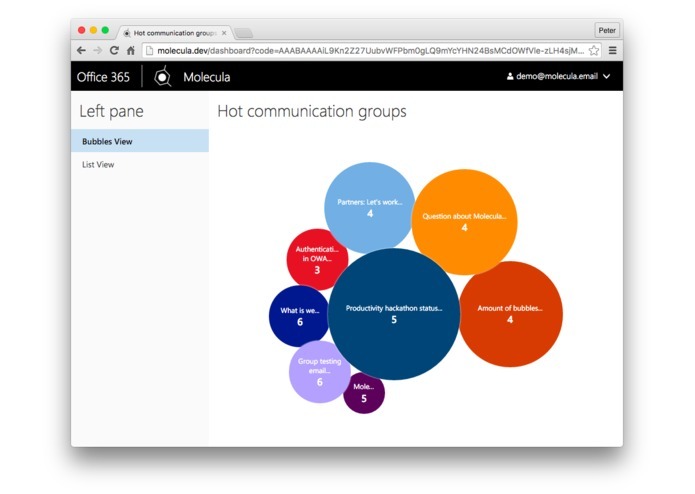 To try it, please go to https://molecula.email/web and log in with your Office 365 account. We have already got some positive feedback from our first beta users. Try it and let us know what you think. Your ideas and support is really appreciated! You can also see the video on our profile page on Devpost!